Happy Wednesday!! 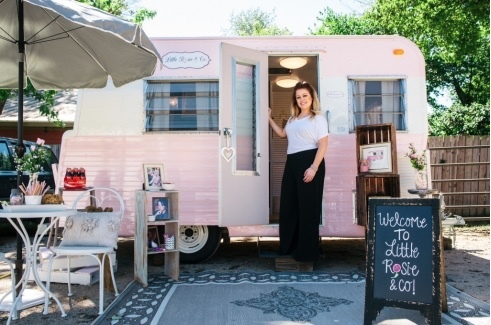 Today we are featuring Little Rosie & Co. A pink 1965 restored trailer with an on location beauty team based out of Nashville, owned by Amanda Cocanougher. We got with Amanda to tell us more about her business. Last August my mom emailed me a picture of a hunter green 1965 Barth travel trailer of of Craigslist. They were asking $600 for it. It looked like a trailer out of a horror movie. Rusted, stained, dirty, and falling apart. The weird part is I LOVED IT and I knew I had to have it. When my friends and family saw the picture they literally questioned my sanity as to why I would want something that appeared to be so junky. I never saw the trailer as junk. I always saw the potential. My amazing step dad, Sonny Thompson, is wonderful at restoring things. And I am good at visualizing things. My mom is very good at micromanaging! So we put our 3 skills together and here we are. She took 10 months to be completed. I honestly didn't plan on using Little Rosie for work it sort of worked itself into that. The more we restored the trailer the more I fell in love with her and wanted to incorporate her into my job. I wanted to share her with everyone because she is the sweetest trailer I have ever seen. I have been a hairstylist and makeup artist for 10 years. I have ALWAYS wanted to be a hairstylist. I also have always had a creative mind and have tried to keep life exciting by coming up with challenges and dreams for myself. I have always specialized in formal occasion hair and makeup. I love getting dressed up myself so to be able to doll up someone else for their special occasion is so much fun for me. I have always wanted a trailer. No particular reason it just always has been a dream of mine to own one. Little Rosie can be the place where the bride and her bridesmaids get glammed up by our team, or she can be used as a photo prop for the bridal party. The set up comes with a bistro table and chairs set, soft wedding music, an outdoor umbrella, lots of shabby decor, various sweet treats and our signature pink lemonade! We are also able to customize our services according to what our clients needs are. What are all the different ways brides can use your services? We plan to use Little Rosie for bridal showers or getting the girls ready for the bachelorette night. We can customize any sort of idea the bride and her bridal party has. Pricing varies for location and the number of services. We specialize in styling hair and makeup for any occasion. We do not style and color hair out of Little Rosie.